We are pleased to inform that the process of election has been set in with appointment of Returning Officer by the District Registrar and publishing of the list for eligible members. The list of members eligible to vote and the collegium they fall in is attached. There are 60 collegium in our colony and total 548 eligible members. After the lapse of 15 days the process for nomination of collegium will start from 16th July onward under the supervision of Returning Officer (RO). 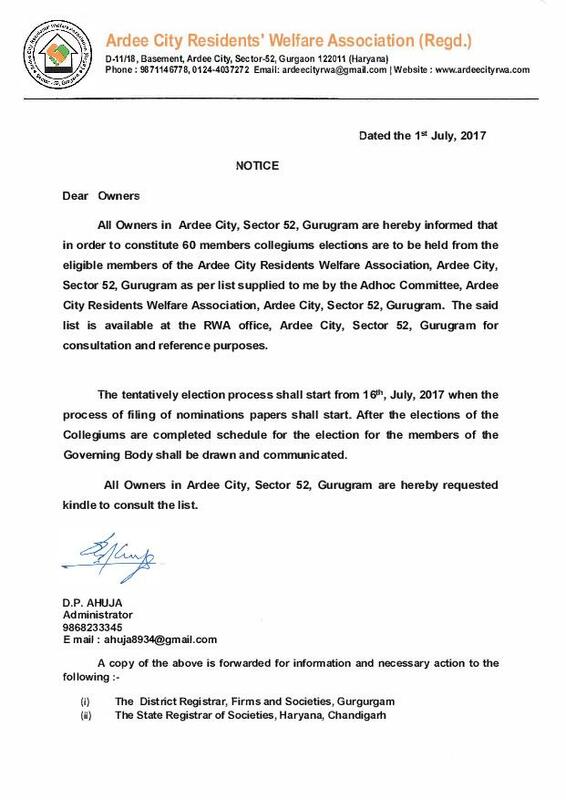 The details will be intimated in time by the RO for smooth and early conduct of RWA election. Let us hope that we have elected RWA in place at an early date. At least learn to write proper English. I am not asked about your hobby. I know you use papers for your pleasure. enjoy. You can take RTI reply and stick it where u feel comfortable. As for my appointment you can verify with RWA president but first we have to see if you are an RWA member or not since you resigned in a conspiratorial manner from the "GENERAL BODY"
Please confirm your appointment as Treasurer with Dist.Registrar, then you talk about other people. RTI reply shows neither you are GB member or collegium member. You have every opportunity prove your election credentials in this election. Need to verify Rastogi ji's credentials and intent.Why he is making process difficult by asking for this bill and that bill..and why he is allowing resigned members to be part of RWA list ? Came to know that a new election officer Mr.S.P.Rastogi has been appointed by District Registrar to conduct the RWA elections which is long overdue. Any feedback in this regard now.